Finnex Reflectors exhibited NHL reflectors and reflective accessories at the Vancouver Gift Expo at the PNE Forum on Sunday, September 17 and Monday, September 18, 2017. Thousands of retail buyers attended the show to find new and unique gifts, accessories, and novelty items that would make their stores stand out. Buyers from all over BC visited our booth. 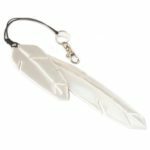 Attracted to everything from our stylish purse charms and Vancouver Canucks® reflectors to our handy transit card holders and bike spoke clips, they saw both the utility and the beauty of our line of reflective accessories and NHL reflectors. 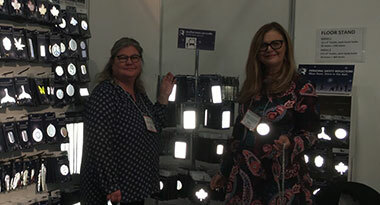 Retail buyers are starting to light up in recognition at the sight of our reflectors. On Sunday, one buyer from the Lower Mainland came by our booth and exclaimed that finding Finnex Reflectors listed online as an exhibitor that very day convinced her to get off the couch and brave the wet and cold weather to get to the show! She later told us that as she approached our booth, she spotted the double-feather reflective purse charm (pictured at left) hanging on a display and made a beeline for it, thrilled to find a stylish design that would be a perfect fit for her customers. Ultimately, she decided to order a selection from our line of purse charms, transit card holders, and more. The same day, a retailer came into our booth, noting with interest the NHL reflectors on display. Browsing through clip-ons for the Canucks® (at right) and other Canadian teams, he inquired why reflectors for last year’s Stanley Cup winners—the Pittsburgh Penguins®—were not available. We quickly explained that they were! In stock at our Burnaby warehouse, NHL licensed reflectors are available for all 31 NHL teams. On Monday, a father-son duo stopped at our booth, struck by how useful the reflectors would be for the son’s hockey team during the upcoming season. The son and his teammates regularly walk across one of Vancouver’s many dark and harrowing high-traffic roads, especially during fall and winter. Our reflective accessories shine in the dark and help pedestrians to be highly visible on city streets. Plus, our reflectors are suited to wet climates: they’re 100% waterproof, and reflective when wet. 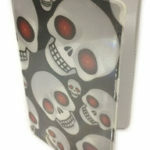 Active users of public transit, the two men saw how transit card holders could help make them more visible at bus stops. Available with a single or double slot, transit card holders are available with and without a rivet in assorted elegant and trendy styles (at left). Made for students and athletes, moms and urban professionals—in short, anyone taking public transit—the reflective transit card holder will reflect clearly the headlights of a bus, and is used easily to tap in to the bus and go. No fuss. And greater safety. A different buyer strolled by our booth and watched the Finnex Reflectors video we were playing. It shows joggers, moms with kids, and others on dark city streets, wearing reflectors that shine brightly in the headlights of vehicles. It also shows a cyclist, with her wheels illuminated by our bike spoke clips. That was enough to grab the buyer’s attention and make her way straight over to the clips on our display. Easy to snap on to bike spokes, the clips come in a 12-pack and are a great fit for the many cyclists who commute to and from work or their school campus throughout the year!